Last Week Tonight with John Oliver is an American late-night talk show created and hosted by John Oliver for HBO. The show takes a satirical look at the week in news, politics and current events. The sixth season of the show premiered on February 17, 2019. 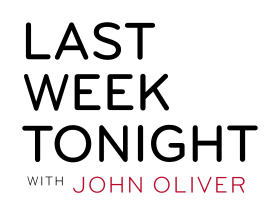 As of April 14, 2019,[update] 157 episodes of Last Week Tonight with John Oliver have aired. Main article: Net Neutrality (Last Week Tonight) § "Net Neutrality"
Other segments: Doug Ford, Jr. Note: This episode was 45 minutes long instead of the regular 30 minutes, and garnered the show international attention due to the appearance of Edward Snowden. Note: Helen Mirren did not appear in person; only parts of the pre-recorded audiobook were played. She read The Senate Intelligence Committee Report on Torture for the episode. Note: Bobby Cannavale did not appear in person. Main article: Net Neutrality (Last Week Tonight) § "Net Neutrality II"
Note: None of these guests appeared in person; only parts of the pre-recorded video were played. All listed guests, except Schirripa, performed a short film about the life of former president Warren G. Harding for the episode, with Harding being depicted by a waxwork purchased by Oliver from the Gettysburg Hall of Presidents wax museum. Note: When broadcast in the United Kingdom, the section covering its Parliamentary censorship laws was replaced with footage of Gilbert Gottfried reading aloud Yelp reviews of Idaho restaurants. Note: When broadcast in the United Kingdom, the section covering Brexit was replaced with footage of Gilbert Gottfried reading aloud parts from the 585-page draft Brexit agreement, because part of it included clips from Parliament, which would breach Parliamentary censorship laws. Note: When broadcast in the United Kingdom, a clip from Parliament is replaced with a clip from “Muscle Motion”. ^ "Last Week Tonight With John Oliver - About the Show". HBO. Retrieved February 13, 2017. ^ Petski, Denise (January 2, 2019). "'Last Week Tonight With John Oliver' Gets Season 6 Premiere Date On HBO". Deadline Hollywood. Retrieved January 2, 2019. ^ a b "Last Week Tonight with John Oliver on HBO's schedule". HBO. Retrieved March 18, 2019. ^ Stanhope, Kate (September 12, 2017). "'Last Week Tonight With John Oliver' Renewed at HBO Through 2020". The Hollywood Reporter. Retrieved January 2, 2019. ^ Bibel, Sara (April 29, 2014). "Sunday Cable Ratings: 'Game of Thrones' Wins Night, NBA Playoffs, 'Real Housewives of Atlanta', 'Mad Men', 'Devious Maids' & More". TV by the Numbers. Retrieved June 17, 2014. ^ Kondolojy, Amanda (May 6, 2014). "Sunday Cable Ratings: 'Game of Thrones' Wins Night, + 'Real Housewives of Atlanta', 'Married to Medicine', 'Silicon Valley' & More". TV by the Numbers. Retrieved June 17, 2014. ^ Bibel, Sara (May 13, 2014). "Sunday Cable Ratings: 'Game of Thrones' Wins Night, NBA Playoffs, 'Silicon Valley', 'Bar Rescue', 'Real Housewives of Atlanta', 'Mad Men' & More". TV by the Numbers. Retrieved June 17, 2014. ^ Kondolojy, Amanda (May 20, 2014). "Sunday Cable Ratings: 'Game of Thrones' Wins Night + 'Silicon Valley', 'Real Housewives of Atlanta', 'River Monsters', 'Married to Medicine' & More". TV by the Numbers. Retrieved June 17, 2014. ^ Kondolojy, Amanda (June 3, 2014). "Sunday Cable Ratings: 'Game of Thrones' Wins Night + NHL Conference Finals, 'Real Housewives of Atlanta: Kandi's Wedding', 'Silicon Valley' & More". TV by the Numbers. Retrieved June 16, 2014. ^ Bibel, Sara (June 10, 2014). "Sunday Cable Ratings: 'Game of Thrones' Wins Night, 'Keeping Up With the Kardashians', 'Devious Maids', 'Veep', 'Turn' & More". TV by the Numbers. Retrieved June 16, 2014. ^ Kondolojy, Amanda (June 17, 2014). "Sunday Cable Ratings: 'Game of Thrones' Wins Night + World Cup Soccer, 'Keeping up with the Kardashians', NASCAR & More". TV by the Numbers. Retrieved June 23, 2014. ^ Bibel, Sara (June 24, 2014). "Sunday Cable Ratings: World Cup Soccer Wins Night, 'True Blood', 'The Last Ship', 'Falling Skies','Devious Maids', 'Penny Dreadful' & More". TV by the Numbers. Retrieved June 28, 2014. ^ Kondolojy, Amanda (July 15, 2014). "Sunday Cable Ratings: 'True Blood' Tops Night + 'The Strain', 'Keeping Up With the Kardashians', 'The Last Ship' & More". TV by the Numbers. Archived from the original on July 17, 2014. Retrieved July 16, 2014. ^ Bibel, Sara (July 22, 2014). "Sunday Cable Ratings: 'True Blood' Wins Night, 'The Last Ship', 'The Strain', 'Witches of East End', 'Ray Donovan' & More". TV by the Numbers. Archived from the original on July 29, 2014. Retrieved July 22, 2014. ^ Kondolojy, Amanda (July 29, 2014). "Sunday Cable Ratings: 'True Blood' Leads Night + NASCAR, 'Keeping Up With the Kardashians', 'The Last Ship', 'The Strain' & More". TV by the Numbers. Archived from the original on July 29, 2014. Retrieved July 29, 2014. ^ Bibel, Sara (August 5, 2014). "Sunday Cable Ratings: 'True Blood' Wins Night, 'The Strain', 'Keeping Up With The Kardashians', 'The Last Ship', 'The Leftovers', 'Falling Skies' & More". TV by the Numbers. Retrieved August 6, 2014. ^ Bibel, Sara (August 19, 2014). "Sunday Cable Ratings: 'True Blood' Wins Night, 'Keeping Up With the Kardashians', 'The Strain', 'The Last Ship', 'The Leftovers' & More". TV by the Numbers. Retrieved August 20, 2014. ^ Metcalf, Mitch (September 9, 2014). "SHOWBUZZDAILY's Top 25 Sunday Cable Originals: 9.7.2014 (and Saturday 9.6.2014)". ShowBuzzDaily. Retrieved April 14, 2015. ^ Metcalf, Mitch (September 16, 2014). "SHOWBUZZDAILY's Top 25 Sunday Cable Originals (& Network Update) : 9.14.2014". ShowBuzzDaily. Retrieved November 12, 2014. ^ Bibel, Sara (September 30, 2014). "Sunday Cable Ratings: 'The Strain' & 'Real Housewives of New Jersey' Win Night, 'Boadwalk Empire', 'Ray Donovan', 'Total Divas', 'Wiches of East End' & More". TV by the Numbers. Retrieved September 30, 2014. ^ Metcalf, Mitch (October 7, 2014). "SHOWBUZZDAILY's Top 25 Sunday Cable Originals (& Network Update) : 10.5.2014". ShowBuzzDaily. Retrieved November 12, 2014. ^ Campbell, Monica (September 11, 2014). "Here's how a military interpreter made it from danger in Afghanistan to safety in the US". Retrieved October 23, 2014. ^ Davidson, Janine (October 23, 2014). "Why Is a Comedian the Only One Talking About the Plight of Afghan Interpreters?". Archived from the original on April 8, 2015. Retrieved October 23, 2014. ^ Pucci, Douglas (October 21, 2014). "Sunday Final Ratings: Peyton Manning Milestone Boosts NBC". TV Media Insights. Retrieved June 6, 2015. ^ Bibel, Sara (October 28, 2014). "Sunday Cable Ratings: 'The Walking Dead' Wins Night, 'Talking Dead', 'Boardwalk Empire', 'Real Housewives of New Jersey', 'Homeland' & More". TV by the Numbers. Archived from the original on October 30, 2014. Retrieved October 28, 2014. ^ Metcalf, Mitch (November 4, 2014). "SHOWBUZZDAILY's Top 25 Sunday Cable Originals (& Network Update) : 11.2.2014". ShowBuzzDaily. Retrieved November 12, 2014. ^ Bibel, Sara (November 11, 2014). "Sunday Cable Ratings: 'The Walking Dead' Wins Night, 'Talking Dead', 'Real Housewives of Atlanta', 'Homeland', 'The Newsroom' & More". TV by the Numbers. ^ Metcalf, Mitch (February 10, 2015). "SHOWBUZZDAILY's Top 25 Sunday Cable Originals (& Network Update): 2.8.2015". Retrieved February 18, 2015. ^ Metcalf, Mitch (February 18, 2015). "SHOWBUZZDAILY's Top 25 Sunday Cable Originals (& Network Update): 2.15.2015". Retrieved February 18, 2015. ^ Metcalf, Mitch (February 24, 2015). "SHOWBUZZDAILY's Top 25 Sunday Cable Originals (& Network Update): 2.22.2015". Retrieved February 24, 2015. ^ Lee, Ashley (March 2, 2015). "Watch 'Last Week Tonight's' Infrastructure Trailer With Edward Norton, Steve Buscemi". The Hollywood Reporter. Retrieved March 2, 2015. ^ "Watch Steve Buscemi and Edward Norton in the 'Last Week Tonight' Action Film 'Infrastructure'". Wall Street Journal. March 2, 2015. Retrieved March 2, 2015. ^ Metcalf, Mitch (March 3, 2015). "SHOWBUZZDAILY's Top 25 Sunday Cable Originals (& Network Update): 3.1.2015". Retrieved March 3, 2015. ^ Metcalf, Mitch (March 10, 2015). "SHOWBUZZDAILY's Top 25 Sunday Cable Originals (& Network Update): 3.8.2015". Retrieved March 10, 2015. ^ Bibel, Sara (March 17, 2015). "Sunday Cable Ratings: 'The Walking Dead' Wins Night, 'Talking Dead', 'Real Housewives of Atlanta', 'Keeping Up With the Kardashians', 'Shameless', 'The Royals' & More". TV by the Numbers. Retrieved March 20, 2015. ^ Metcalf, Mitch (March 24, 2015). "SHOWBUZZDAILY's Top 25 Sunday Cable Originals (& Network Update): 3.22.2015". Retrieved March 25, 2015. ^ Metcalf, Mitch (April 7, 2015). "SHOWBUZZDAILY's Top 25 Sunday Cable Originals: 4.5.2015". Retrieved April 7, 2015. ^ Reed, Ryan (June 15, 2015). "John Oliver Recruits Helen Mirren to Read Senate's Torture Report". Rolling Stone. Retrieved June 17, 2015. ^ Locker, Melissa (June 15, 2015). "John Oliver Conscripts Helen Mirren to Read the Senate's Report on Torture". TIME. Retrieved June 17, 2015. ^ Kondolojy, Amanda (June 16, 2015). "Sunday Cable Ratings: 'Game of Thrones' Tops Night + 'Silicon Valley', NASCAR, 'Botched' & More". TV by the Numbers. Retrieved June 16, 2015. ^ Bibel, Sara (July 21, 2015). "Sunday Cable Ratings: 'Naked and Afraid XL' Wins Night, 'True Detective', 'Ballers', 'The Strain', 'The Last Ship', 'Tut' & More". TV by the Numbers. Retrieved July 21, 2015. ^ Metcalf, Mitch (July 28, 2015). "SHOWBUZZDAILY's Top 100 Sunday Originals (& Network Update): 7.26.2015". ShowBuzzDaily. Retrieved July 28, 2015. ^ Metcalf, Mitch (September 15, 2015). "SHOWBUZZDAILY's Top 100 Sunday Cable Originals (& Network Update): 9.13.2015". ShowBuzzDaily. Retrieved September 18, 2015. ^ Metcalf, Mitch (September 29, 2015). "SHOWBUZZDAILY's Top 100 Sunday Cable Originals & Network Update: 9.27.2015". ShowBuzzDaily. Retrieved October 2, 2015. ^ Metcalf, Mitch (October 6, 2015). "Showbuzz Daily's Top 100 Sunday Cable Originals (& Network Update): 10.4.2015". Showbuzz Daily. Retrieved October 7, 2015. ^ Metcalf, Mitch (October 13, 2015). "SHOWBUZZDAILY's Top 100 Sunday Cable Originals & Network Update: 10.11.2015". ShowBuzzDaily. Retrieved October 13, 2015. ^ "SHOWBUZZDAILY's Top 100 Sunday Cable Originals & Network Update: 10.18.2015". Retrieved November 1, 2015. ^ Metcalf, Mitch (November 3, 2015). "SHOWBUZZDAILY's Top 25 Sunday Cable Originals & Network Update: 11.1.2015". Retrieved November 4, 2015. ^ Porter, Rick (November 17, 2015). "Sunday cable ratings: 'Into the Badlands' starts well for AMC". TV by the Numbers. Retrieved November 17, 2015. ^ Metcalf, Mitch (February 17, 2016). "SHOWBUZZDAILY's Top 150 Sunday Cable Originals & Network Finals: 2.14.2016". Retrieved February 17, 2016. ^ Porter, Rick (February 23, 2015). "Sunday cable ratings: 'Walking Dead' steady, 'RHOA' and 'Shameless' improve". TV by the Numbers. Retrieved February 23, 2015. ^ Metcalf, Mitch (March 1, 2016). "UPDATED:SHOWBUZZDAILY's Top 150 Sunday Cable Originals & Network Finals: 2.28.2016". Retrieved March 3, 2016. ^ Metcalf, Mitch (March 8, 2016). "UPDATED:SHOWBUZZDAILY's Top 150 Sunday Cable Originals & Network Finals: 3.5.2016". Retrieved March 10, 2016. ^ Metcalf, Mitch (March 15, 2016). "UPDATED:SHOWBUZZDAILY's Top 150 Sunday Cable Originals & Network Finals: 3.13.2016". Retrieved March 15, 2016. ^ Metcalf, Mitch (March 22, 2016). "UPDATED:SHOWBUZZDAILY's Top 150 Sunday Cable Originals & Network Finals: 3.20.2016". Retrieved March 22, 2016. ^ Metcalf, Mitch (April 5, 2016). "UPDATED:SHOWBUZZDAILY's Top 150 Sunday Cable Originals & Network Finals: 4.3.2016". Retrieved April 5, 2016. ^ Metcalf, Mitch (April 12, 2016). "UPDATED:SHOWBUZZDAILY's Top 150 Sunday Cable Originals & Network Finals: 4.10.2016". Retrieved April 12, 2016. ^ Metcalf, Mitch (April 19, 2016). "UPDATED:SHOWBUZZDAILY's Top 150 Sunday Cable Originals & Network Finals: 4.17.2016". Retrieved April 20, 2016. ^ Metcalf, Mitch (April 26, 2016). "UPDATED:SHOWBUZZDAILY's Top 150 Sunday Cable Originals & Network Finals: 4.24.2016". Retrieved May 1, 2016. ^ Porter, Rick (May 10, 2016). "Sunday cable ratings: 'Game of Thrones' (very) steady with episode 3". TV by the Numbers. Retrieved May 10, 2016. ^ Porter, Rick (May 17, 2016). "Sunday cable ratings: 'Game of Thrones' rises, 'Fear the Walking Dead' falls". TV by the Numbers. Archived from the original on September 1, 2016. Retrieved May 17, 2016. ^ Porter, Rick (May 24, 2016). "Sunday cable ratings: 'Preacher' has decent debut, 'Game of Thrones' ties season high". TV by the Numbers. Retrieved May 24, 2016. ^ Porter, Rick (June 7, 2016). "Sunday cable ratings: 'Game of Thrones' back to usual numbers, 'Preacher' holds up". TV by the Numbers. Retrieved June 7, 2016. ^ Porter, Rick (June 14, 2016). "Sunday cable ratings: 'Game of Thrones' and 'Silicon Valley' hold steady". TV by the Numbers. Retrieved June 14, 2016. ^ Porter, Rick (June 21, 2016). "Sunday cable ratings: 'Game of Thrones' holds up opposite NBA Finals". TV by the Numbers. Retrieved June 21, 2016. ^ Porter, Rick (June 28, 2016). "Sunday cable ratings: 'Game of Thrones' scores series high with Season 6 finale". TV by the Numbers. Retrieved July 11, 2016. ^ Porter, Rick (July 26, 2016). "Sunday cable ratings: NASCAR races to No. 1, 'Power' stays strong". TV by the Numbers. Retrieved July 26, 2016. ^ Porter, Rick (August 2, 2016). "Sunday cable ratings: 'Sharknado 4' slips, 'Power' up week to week". TV by the Numbers. Retrieved August 21, 2016. ^ Porter, Rick (August 9, 2016). "Sunday cable ratings: 'Power' and NASCAR share the top spot". TV by the Numbers. Retrieved August 21, 2016. ^ Porter, Rick (August 16, 2016). "Sunday cable ratings: 'Power' improves and stays at No. 1". TV by the Numbers. Retrieved August 21, 2016. ^ Porter, Rick (August 23, 2016). "Sunday cable ratings: 'Fear the Walking Dead' returns to series low". TV by the Numbers. Retrieved August 23, 2016. ^ Metcalf, Mitch (October 4, 2016). "Updated: ShowBuzzDaily's Top 150 Sunday Cable Originals & Network Finals: 10.2.2016". ShowBuzzDaily. Retrieved October 9, 2016. ^ Metcalf, Mitch (October 11, 2016). "Updated: ShowBuzzDaily's Top 150 Sunday Cable Originals & Network Finals: 10.9.2016". ShowBuzzDaily. Retrieved October 17, 2016. ^ Porter, Rick (November 1, 2016). "Sunday cable ratings: 'The Walking Dead' takes a bigger-than-usual hit in episode 2". Retrieved November 13, 2016. ^ Porter, Rick (November 8, 2016). "Sunday cable ratings: 'Walking Dead' down but stays on top, 'Real Housewives of Atlanta' returns lower". Retrieved November 13, 2016. ^ Metcalf, Mitch (November 15, 2016). "Showbuzzdailys Top 150 Sunday Cable Originals Network Finals 11 13 2016". Showbuzz Daily. Retrieved November 15, 2016. ^ Porter, Rick (February 14, 2017). "Sunday cable ratings: 'The Walking Dead' improves in its return". TV by the Numbers. Retrieved February 18, 2017. ^ Cipolla, Olivia (February 20, 2017). "Instagram update". Instagram. Retrieved March 1, 2017. ^ Shepherd, Jack (February 20, 2017). "John Oliver enlists group of singing dancers to warn Donald Trump how 'ruthless' President Vladimir Putin". The Independent. Retrieved March 1, 2017. ^ Metcalf, Mitch (February 19, 2017). "SHOWBUZZDAILY's Top 150 Sunday Cable Originals & Network Finals: 2.19.2017". Retrieved February 22, 2017. ^ Porter, Rick (February 28, 2017). "Sunday cable ratings: 'Walking Dead' dips vs. Oscars but remains dominant". TV by the Numbers. Retrieved March 1, 2017. ^ Porter, Rick (March 16, 2017). "Sunday cable ratings: 'The Walking Dead' rebounds a little, 'Feud' slips". TV by the Numbers. Retrieved March 17, 2017. ^ Porter, Rick (April 4, 2017). "Sunday cable ratings: 'The Walking Dead' finale lowest since Season 2". TV by the Numbers. Retrieved April 5, 2017. ^ Porter, Rick (April 11, 2017). "Sunday cable ratings: 'Homeland' ends with season high, 'Casey Anthony' strong for ID". TV by the Numbers. Retrieved April 18, 2017. ^ Porter, Rick (April 18, 2017). "Sunday cable ratings: 'The Leftovers' premiere improves, NBA playoffs dominate". TV by the Numbers. Retrieved April 19, 2017. ^ Porter, Rick (April 25, 2017). "Sunday cable ratings: 'Silicon Valley' suffers without 'Game of Thrones' as lead-in". TV by the Numbers. Retrieved April 29, 2017. ^ Porter, Rick (May 9, 2017). "Sunday cable ratings: MTV Movie & TV Awards down, 'Real Housewives of Atlanta' improves". TV by the Numbers. Retrieved May 12, 2017. ^ Porter, Rick (May 16, 2017). "Sunday cable ratings: 'Into the Badlands' improves, 'Naked and Afraid XL' leads a quiet day". TV by the Numbers. Retrieved May 17, 2017. ^ Porter, Rick (May 23, 2017). "Sunday cable ratings: 'Twin Peaks' return comes in low for Showtime". TV by the Numbers. Retrieved May 24, 2017. ^ Porter, Rick (June 6, 2017). "Sunday cable ratings: 'The Leftovers' ends on up note, 'Fear the Walking Dead' premieres to series low". TV by the Numbers. Retrieved June 7, 2017. ^ Porter, Rick (June 13, 2017). "Sunday cable ratings: 'Fear the Walking Dead' ties low, 'Claws' has decent premiere". TV by the Numbers. Retrieved June 15, 2017. ^ Metcalf, Mitch (June 20, 2017). "SHOWBUZZDAILY's Top 150 Sunday Cable Originals & Network Finals: 6.18.2017". ShowBuzzDaily. Retrieved June 20, 2017. ^ Metcalf, Mitch (June 27, 2017). "SHOWBUZZDAILY's Top 150 Sunday Cable Originals & Network Finals: 6.25.2017". ShowBuzzDaily. Retrieved June 30, 2017. ^ Metz, Brooke (July 8, 2017). "John Oliver recruits Anna Kendrick for Warren G. Harding movie trailer: 7.3.2017". USA Today. Retrieved July 8, 2017. ^ Metcalf, Mitch (July 5, 2017). "SHOWBUZZDAILY's Top 150 Sunday Cable Originals & Network Finals: 7.2.2017". ShowBuzzDaily. Retrieved July 13, 2017. ^ Metcalf, Mitch (August 1, 2017). "SHOWBUZZDAILY's Top 150 Sunday Cable Originals & Network Finals: 7.30.2017". ShowBuzzDaily. Retrieved August 7, 2017. ^ Metcalf, Mitch (August 8, 2017). "SHOWBUZZDAILY's Top 150 Sunday Cable Originals & Network Finals: 8.6.2017". ShowBuzzDaily. Retrieved August 13, 2017. ^ Metcalf, Mitch (August 15, 2017). "SHOWBUZZDAILY's Top 150 Sunday Cable Originals & Network Finals: 8.13.2017". ShowBuzzDaily. Retrieved August 16, 2017. ^ Metcalf, Mitch (August 22, 2017). "SHOWBUZZDAILY's Top 150 Sunday Cable Originals & Network Finals: 8.20.2017". ShowBuzzDaily. Retrieved August 24, 2017. ^ Metcalf, Mitch (September 13, 2017). "SHOWBUZZDAILY's Top 150 Sunday Cable Originals & Network Finals: 9.10.2017". ShowBuzzDaily. Retrieved September 14, 2017. ^ Metcalf, Mitch (September 26, 2017). "SHOWBUZZDAILY's Top 150 Sunday Cable Originals & Network Finals: 9.24.2017". ShowBuzzDaily. Retrieved November 5, 2017. ^ Metcalf, Mitch (October 3, 2017). "SHOWBUZZDAILY's Top 150 Sunday Cable Originals & Network Finals: 10.1.2017". ShowBuzzDaily. Retrieved November 5, 2017. ^ Metcalf, Mitch (October 10, 2017). "SHOWBUZZDAILY's Top 150 Sunday Cable Originals & Network Finals: 10.8.2017". ShowBuzzDaily. Retrieved November 5, 2017. ^ Metcalf, Mitch (October 17, 2017). "SHOWBUZZDAILY's Top 150 Sunday Cable Originals & Network Finals: 10.15.2017". ShowBuzzDaily. Retrieved November 5, 2017. ^ Metcalf, Mitch (October 31, 2017). "SHOWBUZZDAILY's Top 150 Sunday Cable Originals & Network Finals: 10.29.2017". ShowBuzzDaily. Retrieved November 5, 2017. ^ Metcalf, Mitch (November 12, 2017). "SHOWBUZZDAILY's Top 150 Sunday Cable Originals & Network Finals: 11.12.2017". ShowBuzzDaily. Retrieved January 20, 2018. ^ Metcalf, Mitch (February 20, 2018). "SHOWBUZZDAILY's Top 150 Sunday Cable Originals & Network Finals: 2.18.2018". ShowBuzzDaily. Retrieved March 1, 2018. ^ Metcalf, Mitch (February 27, 2018). "SHOWBUZZDAILY's Top 150 Sunday Cable Originals & Network Finals: 2.25.2018". ShowBuzzDaily. Retrieved March 1, 2018. ^ Metcalf, Mitch (March 6, 2018). "UPDATED: SHOWBUZZDAILY's Top 150 Sunday Cable Originals & Network Finals: 3.4.2018 - Showbuzz Daily". showbuzzdaily.com. Retrieved April 9, 2018. ^ Metcalf, Mitch (March 13, 2018). "SHOWBUZZDAILY's Top 150 Sunday Cable Originals & Network Finals: 3.11.2018 - Showbuzz Daily". showbuzzdaily.com. Retrieved April 9, 2018. ^ Metcalf, Mitch (March 20, 2018). "UPDATED: SHOWBUZZDAILY's Top 150 Sunday Cable Originals & Network Finals: 3.18.2018 - Showbuzz Daily". showbuzzdaily.com. Retrieved April 9, 2018. ^ Metcalf, Mitch (April 3, 2018). "Updated: ShowBuzzDaily's Top 150 Sunday Cable Originals & Network Finals: 4.1.2018". showbuzzdaily.com. Retrieved April 9, 2018. ^ Metcalf, Mitch (April 10, 2018). "Updated: ShowBuzzDaily's Top 150 Sunday Cable Originals & Network Finals: 4.8.2018". showbuzzdaily.com. Retrieved April 20, 2018. ^ Metcalf, Mitch (April 17, 2018). "Updated: ShowBuzzDaily's Top 150 Sunday Cable Originals & Network Finals: 4.15.2018". showbuzzdaily.com. Retrieved April 20, 2018. ^ Metcalf, Mitch (April 24, 2018). "Updated: ShowBuzzDaily's Top 150 Sunday Cable Originals & Network Finals: 4.22.2018". showbuzzdaily.com. Retrieved April 30, 2018. ^ Metcalf, Mitch (May 10, 2018). "Updated: ShowBuzzDaily's Top 150 Sunday Cable Originals & Network Finals: 5.6.2018". showbuzzdaily.com. Retrieved May 12, 2018. ^ Metcalf, Mitch (May 15, 2018). "Updated: ShowBuzzDaily's Top 150 Sunday Cable Originals & Network Finals: 5.13.2018". showbuzzdaily.com. Retrieved June 18, 2018. ^ Metcalf, Mitch (May 22, 2018). "Updated: ShowBuzzDaily's Top 150 Sunday Cable Originals & Network Finals: 5.20.2018". showbuzzdaily.com. Retrieved June 18, 2018. ^ Metcalf, Mitch (June 5, 2018). "Updated: ShowBuzzDaily's Top 150 Sunday Cable Originals & Network Finals: 6.3.2018". showbuzzdaily.com. Retrieved June 18, 2018. ^ Metcalf, Mitch (June 12, 2018). "Updated: ShowBuzzDaily's Top 150 Sunday Cable Originals & Network Finals: 6.10.2018". showbuzzdaily.com. Retrieved June 18, 2018. ^ Metcalf, Mitch (June 19, 2018). "Updated: ShowBuzzDaily's Top 150 Sunday Cable Originals & Network Finals: 6.17.2018". showbuzzdaily.com. Retrieved June 25, 2018. ^ Metcalf, Mitch (June 26, 2018). "Updated: ShowBuzzDaily's Top 150 Sunday Cable Originals & Network Finals: 6.24.2018". showbuzzdaily.com. Retrieved July 29, 2018. ^ Metcalf, Mitch (July 3, 2018). "Updated: ShowBuzzDaily's Top 150 Sunday Cable Originals & Network Finals: 7.1.2018". showbuzzdaily.com. Retrieved July 29, 2018. ^ Metcalf, Mitch (July 31, 2018). "Updated: ShowBuzzDaily's Top 150 Sunday Cable Originals & Network Finals: 7.29.2018". showbuzzdaily.com. Retrieved July 31, 2018. ^ Metcalf, Mitch (August 5, 2018). "Updated: ShowBuzzDaily's Top 150 Sunday Cable Originals & Network Finals: 8.5.2018". showbuzzdaily.com. Retrieved August 12, 2018. ^ Metcalf, Mitch (August 12, 2018). "Updated: ShowBuzzDaily's Top 150 Sunday Cable Originals & Network Finals: 8.12.2018". showbuzzdaily.com. Retrieved August 17, 2018. ^ Metcalf, Mitch (August 19, 2018). "Updated: ShowBuzzDaily's Top 150 Sunday Cable Originals & Network Finals: 8.19.2018". showbuzzdaily.com. Retrieved August 22, 2018. ^ Metcalf, Mitch (September 9, 2018). "Updated: ShowBuzzDaily's Top 150 Sunday Cable Originals & Network Finals: 9.9.2018". showbuzzdaily.com. Retrieved September 16, 2018. ^ Metcalf, Mitch (September 23, 2018). "Updated: ShowBuzzDaily's Top 150 Sunday Cable Originals & Network Finals: 9.23.2018". showbuzzdaily.com. Retrieved September 25, 2018. ^ Metcalf, Mitch (September 30, 2018). "Updated: ShowBuzzDaily's Top 150 Sunday Cable Originals & Network Finals: 9.30.2018". showbuzzdaily.com. Retrieved October 8, 2018. ^ Metcalf, Mitch (October 10, 2018). "Updated: ShowBuzzDaily's Top 150 Sunday Cable Originals & Network Finals: 10.7.2018". showbuzzdaily.com. Retrieved October 11, 2018. ^ Metcalf, Mitch (October 14, 2018). "Updated: ShowBuzzDaily's Top 150 Sunday Cable Originals & Network Finals: 10.14.2018". showbuzzdaily.com. Retrieved October 21, 2018. ^ Metcalf, Mitch (October 28, 2018). "Updated: ShowBuzzDaily's Top 150 Sunday Cable Originals & Network Finals: 10.28.2018". showbuzzdaily.com. Retrieved October 30, 2018. ^ Metcalf, Mitch (November 4, 2018). "Updated: ShowBuzzDaily's Top 150 Sunday Cable Originals & Network Finals: 11.4.2018". showbuzzdaily.com. Retrieved November 11, 2018. ^ Metcalf, Mitch (November 11, 2018). "Updated: ShowBuzzDaily's Top 150 Sunday Cable Originals & Network Finals: 11.11.2018". showbuzzdaily.com. Retrieved November 19, 2018. ^ Metcalf, Mitch (November 18, 2018). "Updated: ShowBuzzDaily's Top 150 Sunday Cable Originals & Network Finals: 11.18.2018". showbuzzdaily.com. Retrieved November 21, 2018. ^ Metcalf, Mitch (February 19, 2019). "Updated: ShowBuzzDaily's Top 150 Sunday Cable Originals & Network Finals: 2.17.2019". showbuzzdaily.com. Retrieved February 24, 2019. ^ Metcalf, Mitch (February 24, 2019). "Updated: ShowBuzzDaily's Top 150 Sunday Cable Originals & Network Finals: 2.24.2019". showbuzzdaily.com. Retrieved March 2, 2019. ^ Metcalf, Mitch (March 5, 2019). "Updated: ShowBuzzDaily's Top 150 Sunday Cable Originals & Network Finals: 3.3.2019". showbuzzdaily.com. Retrieved March 5, 2019. ^ Metcalf, Mitch (March 12, 2019). "Updated: ShowBuzzDaily's Top 150 Sunday Cable Originals & Network Finals: 3.10.2019". showbuzzdaily.com. Retrieved March 12, 2019. ^ Metcalf, Mitch (March 19, 2019). "Updated: ShowBuzzDaily's Top 150 Sunday Cable Originals & Network Finals: 3.17.2019". showbuzzdaily.com. Retrieved March 19, 2019. ^ Metcalf, Mitch (April 2, 2019). "ShowBuzzDaily's Top 150 Sunday Cable Originals & Network Finals: 3.31.2019". showbuzzdaily.com. Retrieved April 2, 2019.